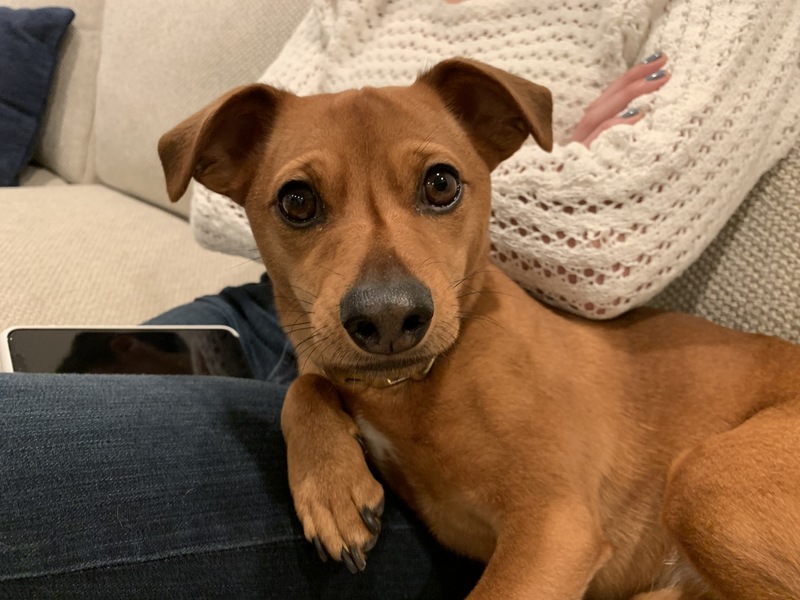 For this Santa Monica dog training session, we teach and adorable 4 year-old Chihuahua / MinPin / Terrier mix named Nellie to focus and to stay behind an invisible line away from the door when packages are delivered to stop her territorial behavior. We actually did two separate sessions with Nellie. The first one was at her guardian’s home where we focused on adding in rules and structure to help Nellie see her human as the leader / authority figure. One of the things we went over in that session was teaching Nellie to focus on her guardian on command to help her redirect the dog’s attention. Plus, the way I teach this exercise can actually stop the production of cortisol (the stress hormone). You can watch me train a dog to focus in the free dog training video below. Its also going to be important for the guardian to consistently enforce rules for the next month or two so that Nellie sees her acting like a leader. Dogs tend to judge our leadership by our actions. Are we enforcing rules, rewarding desired behavior and following through? Its going to be tough at times as Nellie is even cuter in person than in the photo and videos. A dog can know what you want them to do and still not do it if they don’t respect you as an authority figure. Fortunately for Nellie, her guardian is committed and Im confident she is going to be equal to the task. The second session took place a few days later at Nellie’s guardian’s work space. I had originally planed on teaching the dog to move away from the door when it hears a buzzer that delivery people trigger to get into the building. However the sound was actually a phone ringing and the door was far away from the place I originally planned on conditioning Nellie to go to so I scrapped that plan. Instead I showed the guardian how to claim the area around the door and teach Nellie to move about 15 feet away when there is anyone at the door. You can learn how to teach a dog to stay behind an invisible line in the free dog training video below. I added in a few new wrinkles to this exercise, assigning a command word of delivery and using positive reinforcement to train the dog to move away from the door on command. I also recommended the delivery people toss a treat to Nellie when they leave which should help her form a positive association with this activity. To help the guardian remember all the dog behavior tips I shared in this in home and at work dog training session, we shot a roadmap to success video you can watch below.